The AcrySof® ReSTOR® intraocular lens (IOL) is a revolutionary new artificial lens that can restore a patient's full range of vision while simultaneously reducing a patient's dependence on bifocals or prescription reading glasses. 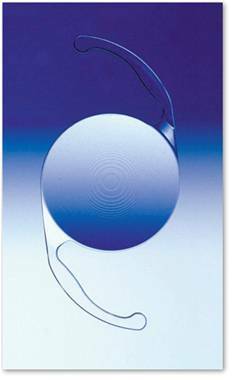 The ReSTOR® lens can be used as an implant with either Refractive Lens Exchange surgery or during Cataract Surgery. The patented design utilizes “apodized diffractive technology”, which distributes light simultaneously for distance and near focal points. This results in excellent visual acuity of nearby as well as faraway objects, allowing patients to read the print on medicine bottles, newspapers, and magazines while also providing vision of distant objects. Clinical trials have shown that 80% patients who have undergone bilateral ReStor surgery never needed glasses again for any reason following the procedure. In fact, 84 percent of patients experienced 20/25 distance vision or better and 20/32 near vision or better. 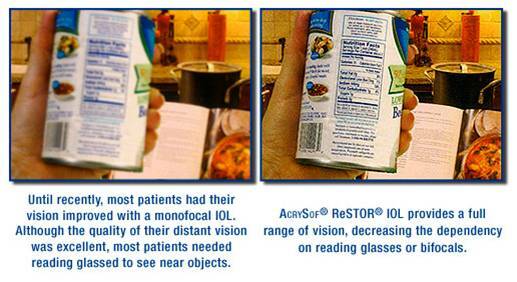 Eighty-five percent of AcrySof® ReSTOR® patients experienced 20/40 binocular intermediate vision or better.